Image caption An EU source told the BBC that the labels would have to include the word "settlement"
The European Commission has issued new guidelines for the labelling of some products made in Israeli settlements on occupied land. Agricultural produce and cosmetics sold in EU member states must now have clear labels showing their place of origin. Israeli PM Benjamin Netanyahu said the EU "should be ashamed of itself". The EU considers settlements built on territories occupied by Israel in 1967 to be illegal under international law, but Israel disputes this position. The EU says settlements constitute an obstacle to peace and threaten to make a two-state solution to the Israeli-Palestinian conflict impossible. Mr Netanyahu, who was in Washington on an official visit, called the decision "hypocritical and a double standard". The Israeli foreign ministry has summoned the EU ambassador to Israel and said it would suspend diplomatic dialogue in the coming weeks. At a meeting in Brussels on Wednesday, the European Commission adopted an "interpretative notice on indication of origin of goods from the territories occupied by Israel since June 1967". The Commission says the territories comprise the Gaza Strip and the West Bank, including East Jerusalem, and the Golan Heights, which were captured from Syria. What exports are subject to the new rules? Mandatory indication of origin applies notably to fresh fruit and vegetables, wine, honey, olive oil, eggs, poultry, organic products and cosmetics. Voluntary indication of origin applies to pre-packaged foodstuffs and the majority of industrial products. What is the Commission's suggested wording? For products from West Bank or the Golan Heights that originate from settlements, the expression "Israeli settlement" or equivalent needs to be added, in brackets, for example. So, "product from the Golan Heights (Israeli settlement)" or "product from West Bank (Israeli settlement)" could be used. Products from the West Bank not originating from settlements could be labelled "product from Palestine" or "product from West Bank (Palestinian product)". Since 2009, the UK has implemented voluntary guidelines for labelling, which distinguishes West Bank produce made in Israeli settlements from Palestinian West Bank produce. Similar guidelines have been put in place by Denmark and Belgium. An EU source told the BBC that the labels would have to include the word "settlement", as under EU consumer law it would be misleading to simply mark them as products from Israel or from the Palestinian territories. The source said this was not a new obligation or a political decision, but designed to clarify member states' obligations to ensure consumers are fully informed. The EU, the source added, does not view the occupied territories as legally part of Israel, so products from there cannot be labelled as from Israel or benefit from preferential trade agreements. Since 2004, produce from settlements have not benefited from trade preferences, and EU law already requires the places of origin of fruits, vegetables and honey to be labelled. Israel's economy ministry estimates that the impact of Wednesday's decision will be about $50m (€47m; £33m) a year, according to Reuters. EU imports from Israel were worth around €13bn ($14bn; £9bn) in 2014. "We regret that the EU has chosen, for political reasons, to take such an exceptional and discriminatory step, inspired by the boycott movement, particularly at this time, when Israel is confronting a wave of terrorism targeting any and all of its citizens," Israel's foreign ministry said, referring to a recent wave of stabbings of Israelis by Palestinians. "It is puzzling and even irritating that the EU chooses to apply a double standard concerning Israel, while ignoring that there are over 200 other territorial disputes worldwide." The EU says Israel's occupation means the situation in the Palestinian territories is considered not comparable to other territories like Cyprus or Western Sahara. The Israeli foreign ministry also said product labelling would not advance the peace process, but "strengthen the radical elements advocating a boycott against Israel and denying Israel's right to exist". 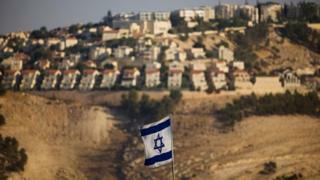 "It may also have implications for Israel-EU relations," it warned. Correction 14 December 2015: This story has been amended after an earlier version implied the new EU guidelines defined the occupied land as "Palestinian and Syrian".